Ever since I got a rotary tool this past christmas I have been looking online for a project that appeals to my taste but wouldn’t break the bank when I started to buy supplies. 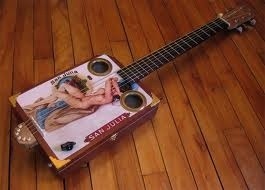 After deciding to build my own cigar box guitar (cbg), I then had the task of deciding what I wanted it to look like. There are literally thousands of different ideas flying through my mind. Which leads me to believe that this won’t be the last one I build. I am currently still in the development phase of the project so all the pictures in this blog are of other people’s work. I am simply using them as examples of what I want to achieve. From what I have seen so far, most cbg’s have three strings and use parts that weren’t originally planned for use on a guitar. Anything from door hinges to crumb cups which are supposed to keep your kitchen sink from getting clogged with food. 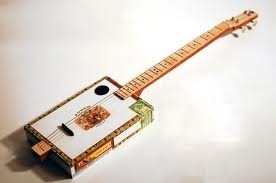 The improvised parts can make or break the look of the cbg. If done right it looks like a very cool mish-mash of parts. If done wrong it looks like a shoebox that a robot pooped on. 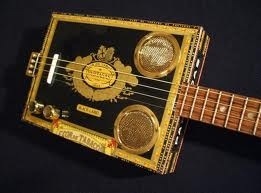 The other type of cbg’s I’ve seen are basically a factory quality electric guitar which just happens to be made with the use of a cigar box. These ones have six strings, use professional grade bridges, pickups, and necks. Not the kind of project I would have the skill, time, or money to pull off. Below are two photos. One of the most simple cbg, the other of a masterpiece of craftsmanship. Since my musical talents are weak at best, I’m going in with very little info on the inner workings of a guitar and how to build one. 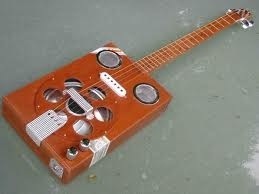 But I doubt most guitar players have ever built one themselves. That gives me a bit of confidence. 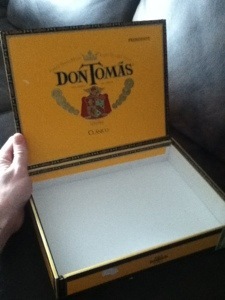 All I know at this point is which one of my cigar boxes I’m going to try this on and which parts I’m buying from the hardware store and online. There are web pages which I will discuss in blogs to come that offer anything you may need to get started on making a cbg of your own. 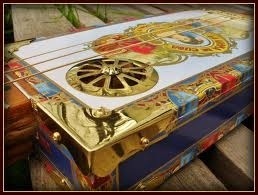 My personal favorite cbg’s are the ones that use a box with plenty of design on it. Decals, crests, trim, brass, lots of brass. If I had my way I’d put as many accents on it as I could, but I must remember a very important design tip. Balance is key, clutter is confusing. 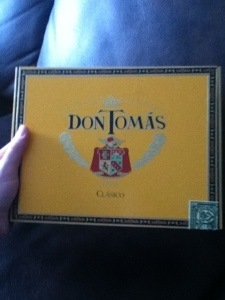 I plan on using the box pictured above as my cbg body. The size is perfect and the colors will pop with the hardware and add ons I have planned. The crest on the middle of the lid is positioned perfectly for me to add the dials and sound holes exactly where I want them to go without having to cut or cover any of the existing detail. The inside of the box has plenty of space for me to run the neck all the way to the bridge so that the guitar is very sturdy and rigid. My main concern of starting the project was having the neck break but this way I can build it tough enough to take a good rock and rolling. As I make progress in my build I will keep you posted. From the info I have received online, building the neck is the hard part. Once it is attached to the box and fretted, the rest is smooth sailing. I hope. I have my home made blueprints ready. Now I just have to order the parts and patiently wait for the slow Canadian mail system to deliver them. If you have any tips or advice let me know. I’m open to all help. 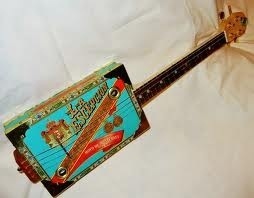 I will leave you with a few more pictures of cbg’s that really appealed to my taste. Like I said there are thousands of possibilities, here are only a few. 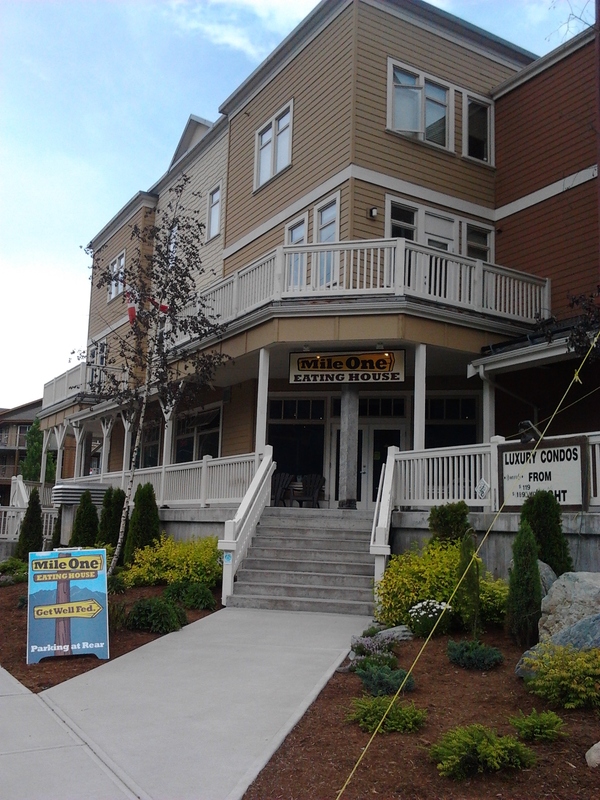 Here is a blog my Wife Kat posted about our recent trip to British Columbia. Our trip was fantastic! Enjoy. My Husband I just returned from a breathtaking trip to beautiful British Columbia, Canada. It was a surprise gift my Husband Brent received from our Family. You can view the surprise here. Brent and I packed up the car and drove to Pearson Airport in Toronto, Ontario. We had a night flight which was 2 hours delayed. By the time the plane took off the runway, it was 12AM. We arrived in Vancouver, BC at 2AM local time. Needless to say we were exhausted but overly excited so we didn’t sleep on the plane. Thank you for tasting my hamburger! When I woke up today I started getting ready for work. I’m getting dressed and I hear my wife – Kat in the other room. “BRENT, Holy, Brent, Oh My God, What.” At first I thought I had broken something, spilled something, left the balcony door unlocked maybe. She went on to tell me I’d been Freshly Pressed. At first I didn’t really get it until she told me how many hits I had so far. I wanted to say thank you so much to WordPress and to everyone who has read my blog. It has really made me excited to continue on with writing. I will work as fast as I can to respond to every one of the comments I’ve gotten. I’m still a bit overwhelmed that this got the response it did, and clearly so was my wife. Honestly, I’ve only seen her get this excited for when I proposed, our wedding day, last Christmas, and now for my hamburger blog. Lol. Last month, my wife encouraged me to blog. She started her own a bit before I did. A big thanks goes out to her. In fact, when we started dating, her online profile said she could make a wicked hamburger. So I dedicate this post to her. Check out her blog here. It’s very good, and it’s why I started my own. She sometimes writes about nail art she creates herself. This is not her pic but I thought it was a good way to mesh our styles together. Another funny story, we were in the drive through at a local fast food restaurant last week, we both ordered hamburgers, and the lady working the drive through told my wife her nails were amazing. True story. So the glue that keeps she and I together must be made from hamburgers and nails. How sweet. Thanks again to everybody, I’ll be responding to all comments as fast as I can. 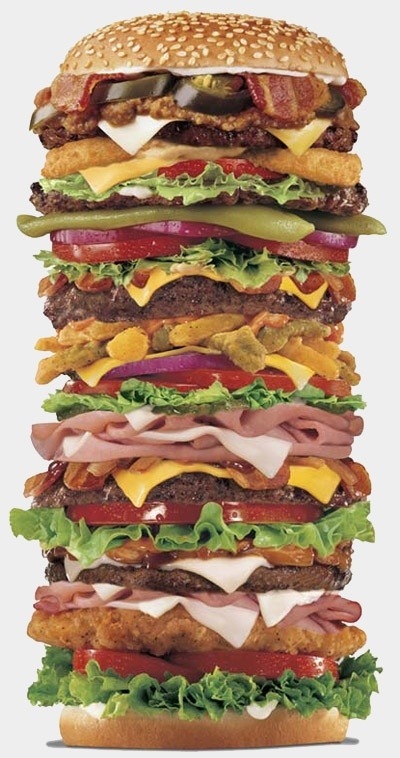 See you all in hamburger heaven. Photos courtesy of google pictures. How to hold a hamburger properly. Have you ever been watching a fast food commercial and wondered why paid actors can’t hold hamburgers like normal people. It’s makes me laugh every time I see it. Holding a hamburger can be considered a science, and the directors of these commercials must have failed science in school. When you consider how many different burgers are available, technique may vary from one to another, but should never resemble what I see in these ads. So I have decided to give a few pointers on the do’s and dont’s of how to properly hold a hamburger, without looking like a paid actor. This guy above has it all wrong. Poking at the bun with his weak little fingers. Giving no support at all to the contents inside. This hamburger doesn’t stand a chance. 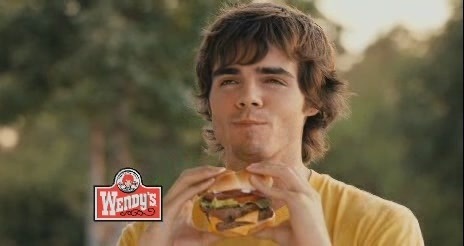 And look at his face, he looks like he’s reminiscing about an old girlfriend, maybe Wendy was her name. A few tips I could give him would be: 1. They make burgers to fit in the palm of your hand, so use your palms, not just the fingertips. It’ll help keep your burger from sliding and shifting, and less things will fall out of it. 2. 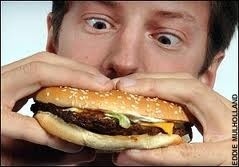 Use your fingers to stop the patty from sliding to the opposite end of the side you are eating. 3. Concentrate. Pay attention, no daydreaming about a world where we all hold burgers like a-holes. This guy here knows a bit better. He still has a lot to learn about hand position, but I really admire his aggression and complete disregard for table manners and the opinions of others. He’s getting awfully close to the desired u shape that your hands should be in. When your hands are c shaped, it’s not natural. Just try it now without a burger. U shaped I could keep my hands like that all day, C shaped my hands cramp up and get tired. Most people would say his girlfriend is looking disgusted because he’s being a slob. I disagree, she’s probly thinking either that she can’t enjoy her salad as much as he’s enjoying his burger, or why the hell is he holding it like that, what am I doing with him, will our kids hold burgers like an a-hole too. This isn’t rocket science. I want to hit this guy. Pinky and index under, middle and ring over? Eyes crossed. I hate to use an already overused Internet word, but here goes. FAIL! I looked on google for a half hour looking for one picture of a proper burger holding technique, this is the best I could find. 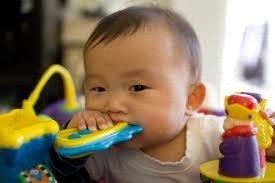 Folks, an infant can do it right. Why can’t we. This kids got all the right ideas. Full contact with the hand. Fingers, palms, the whole thing. The use of both hands is a must, but at least this kid has one hand right, which is more than I can say about the others. So I guess I didn’t give as many pointers as I thought. The only thing I ask is that the next time you grab a burger, ask yourself a few times while you are eating “do I look like a moron?” if you answer yes, put the burger down and order something else. God put napkins here for a reason. Get your hands dirty you nancy boy. Think of it as a sport. You get points if nothing falls out and the coach doesn’t care if your uniform gets dirty. Do you remember the saying to dance like nobody is watching. Same thing applies here. Eat like you just don’t give a damn. Pictures all courtesy of google images.